B.A.D. 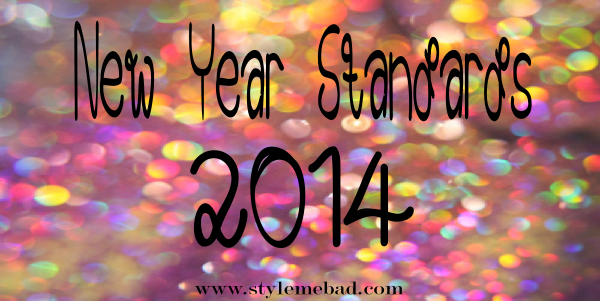 Girl Tip: Set Your Standards for the New Year | Style Me B.A.D. I’ve mentioned in previous posts how I no longer set resolutions or goals because they are future focused and don’t allow for you to feel accomplished NOW. This leads to feeling discouraged and straying off from what you set out to accomplish. I set standards that I vow to stick to on a daily basis that will ultimately allow me to be happy, positive and successful everyday not 1, 3 or 6 months from now. Eat Cleaner. I am eliminating McDonald’s and Burger King from my diet. Blog Consistently. Publish at least 3 blog posts a week. Save Money. I am going to put away a minimum amount each month. Grow My Business. Do at least one thing aimed at growth everyday. Get Organized. I am buying a planner and creating the day that I want in advance. What standards will you be implementing for the New Year? P.S. Check out the post I wrote on the Goodwill Blog with tips for sticking to your resolutions HERE. ugh no I hate myself every time I eat it so I am finally make an effort to not touch it ever again! I think I will copy your standards for the new year! Although my ‘resolution’ or standard for 2014 is to do what makes me happy. Selfish? Yes. But I’ve spent too long making decisions based on how others may feel! Not selfish at all! That’s an excellent standard. If it doesnt make you happy dont do it. We have some of the same goals this year. I definitely want to eat cleaner, save more money, have better quality blog content, and read more books this year. I want to read more books too! I’m on the hunt for my first good read, any recommendations?! Love this post and I’m totally with ya! It’s all about short term goals so hitting every point seems more feasible! Thanks girl and happy new year to you too! I am also eating cleaner this year. I know it has only been a few days but I swear I already feel much better. Other things I hope to accomplish change jobs or maybe even careers, get enough sleep, and overall just be kinder to myself. Being kind to yourself is SO important Tracy! I am happy your eating clean is working out! Keep me posted! Next PostB.A.D. Girl Link Love: An Inspiration for All Women & Men Too!